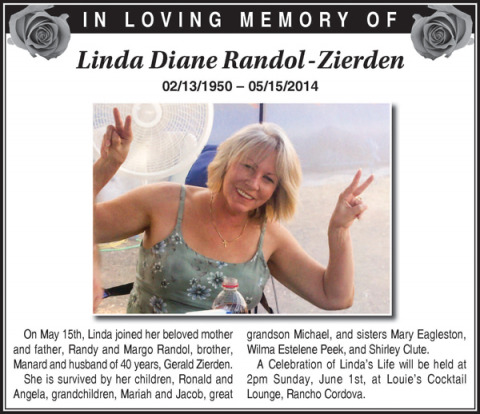 On May 15th, Linda joined her beloved mother and father, Randy and Margo Randol, brother, Manard and husband of 40 years, Gerald Zierden. She is survived by her children, Ronald and Angela, grandchildren, Mariah and Jacob, great grandson Michael, and sisters Mary Eagleston, Wilma Estelene Peek, and Shirley Clute. A Celebration of Linda’s Life will be held at 2pm Sunday, June 1st, at Louie’s Cocktail Lounge, Rancho Cordova.